In the summer, I love a lightweight moisturizer that has SPF. The worst thing in the world is a day cream that runs and sweats into your eyes when the heat is on. 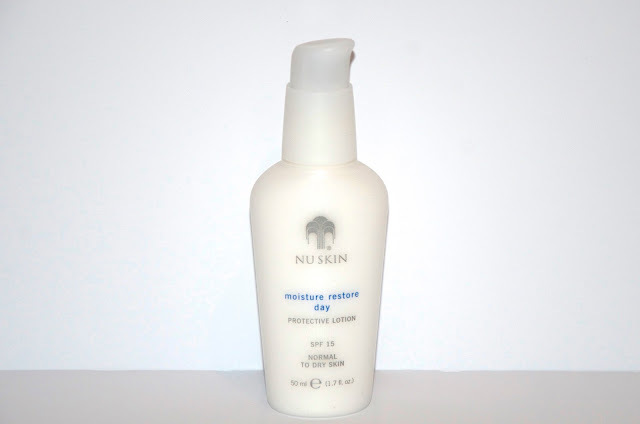 I'm currently obsessed with Nu Skin Moisture Restore Day Protective Lotion. This super light moisturizer contains colorless carotenoids that enhance the skin's natural resistance to the environment and offer increased protection against light-induced free radical damage. Nu Skin Moisture Restore Day is smooth, silky and feels amazing on the skin... It doesn't interfere with my make-up at all and it smells absolutely lovely. This is definitely the moisturizer I'll be wearing during the day this summer! Nu Skin Moisture Restore Day Protective Lotion is £36.50 online and available from Nu Skin.